Crystal Crush is a very unique online casino game. It's more like a social game rather than a traditional slot. Crystal Crush is a crystal-themed slot by Playson with an unusual set-up. Instead of the usual reels and paylines, there is a hexagonal grid. The aim of the game is to make winning combinations by landing clusters of 5 or more. You'll have to fill up meters to unlock the new and exciting levels where you'll find wilds and multipliers galore. The design is very quirky and colourful and gameplay is really magical. Crystal Crush is a unique slot by Playson with a crystal theme. You'll find no reels or paylines here. Instead, you'll be met by a hexagonal grid with 61 crystal shaped symbols inside. The design is bright, colourful and sparkly; exactly what you would expect from a crystal-themed game. In the background, you'll see a relaxing scene of sandy beaches, clear skies, calm waters, and a little fishing boat. There are 6 crystal symbols all of varying shapes, colours, and sizes. These include a red fire crystal, turquoise moon crystal, purple raindrop crystal, blue leaf crystal, green shamrock crystal, and an orange star crystal. 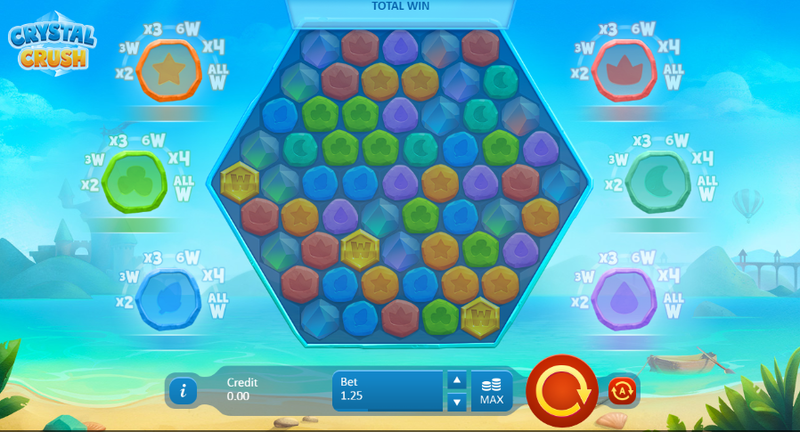 Cluster Wins - Land 5 or more matching symbols in the hexagonal grid to form a winning combination. The symbols that created your winning combination will be removed from the grid and will be replaced with new ones. Continue playing until no more winning combinations can be made. The Wild Symbol - The wild symbol is the golden crystal etched with a 'W'. This replaces all other symbols apart from the crystallised symbols. The Orange Symbol - The orange symbol is the highest paying symbol in Crystal Crush. Landing a cluster of 9 or more will award up to 6.4x your total stake. Crystallised Symbols - The crystallised symbols fill in the progress bar. These are crushed and become paying symbols if they are near a standard winning combination. Crystal Crush Feature - Crush 3 crystals to unlock the crystal crush feature. There are 6 bonus levels, all of which are very exciting. For example, bonus level 4 will turn up to 6 random symbols of the same colour wild, and bonus level 5 awards a 4x multiplier on any wins featuring the same colour symbol. where else other than https://www.slotsbaby.com/ would you find such innovative games? If you're bored of slots with the same themes, then you'll enjoy a change with Crystal Crush. Crystal Crush is a unique and entertaining game. The design is colourful and simple and gameplay is repetitive and fun. With top payouts being up to 409x your stake, it's not bad for an entertaining and creative real slot games online.